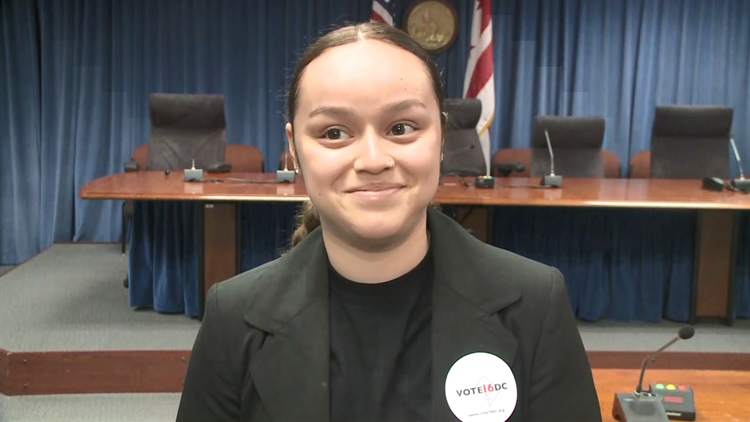 Helisa Cruz, 16-year-old student at BASIS DC Public Charter School and supporter of Vote16DC. If a bill heading to the D.C. City Council this month becomes law, 16- and 17-year-olds living in the District could be the first in the country to cast a vote for president in the 2020 election. WASHINGTON, D.C. -- If a bill heading to the D.C. City Council this month becomes law, 16- and 17-year-olds living in the District could be the first in the country to cast a vote for president in the 2020 election. On Thursday, the D.C. City Council Committee on the Judiciary and Public safety unanimously voted to send the Youth Vote Amendment Act of 2018 to the full council. The bill would make D.C. the fifth city in the country to grant voting rights to 16- and 17-year-olds, and the first to allow voters under 18 to cast a ballot in federal elections. The bill will go before the full council on Nov. 13. D.C.’s northern neighbor, Maryland, has led the nation in expanding suffrage to 16- and 17-year-olds. Currently three Maryland cities – Takoma Park, Hyattsville and Greenbelt – allow 16- and 17-year-olds to vote in local elections and referendums. A fourth U.S. city, Berkeley, California, allows 16- and 17-year-olds to vote in school board elections only. Many states do currently allow teens to vote in primary elections if they will be 18 years old by the date of general election. A study conducted by Vote16USA of 16- and 17-year-old voters in Takoma Park in the 2013 and 2015 elections found that turnout among registered 16- and 17-year-olds was significantly higher than the overall registered population – 45 percent of registered 16- and 17-year-old voters cast a ballot in November 2015, versus 21 percent of all registered voters. However, the study also found that only 36 percent of eligible 16- and 17-year-olds registered to vote in 2013. That number dropped to 28.4 percent in 2015. According to Vote16DC, the D.C. Office of Planning estimates there are 10,400 16- and 17-year-olds living in the District. At voting rates similar to those observed in Takoma Park in 2015, those 10,400 potential voters would represent approximately 1,329 additional ballots in the 2020 election. Participation might be higher for D.C.’s 16- and 17-year-old voters in 2020, however, since 2015 was a municipal election year and D.C.’s teen voters would be allowed to cast a ballot for president, unlike those in Takoma Park. The bill was introduced in April by Ward 6 Councilman Charles Allen. Six other councilors signed on as co-introducers to the bill, and a seventh, At-Large Councilwoman Elissa Silverman, has since announced her support for it. If approved by the full council and signed by the mayor, the bill would head to Congress for a 30-day review period before becoming law.